when the guns do not rattle and boom anymore, and the sky, the land and the sea become calm and serene, when tranquillity reigns through it is natural to live in the present moment and forget the past. But one cannot live in the present without a past. Nor can one envision the future discarding the experience of the preceding events. Hence the Daily News is serialising the Chronicle of LTTE Terror taken from our own archives which would remind our readers how it all began. It was not simple terror. Nor was terror sporadic. It was all pre-planned, pre-determined, well-calculated terror. The victims were innocent people. Though it is too many innumerate we would like to recall the major episodes in the Chronology of Terror. One of the blackest episodes in the separatist war occurred on Good Friday 1987 when over 100 bus passengers were mowed down by LTTE machine gun fire near Kitulottuwa on the Trincomalee Habarana road. The victims belonging to all communities were shot dead in cold blood, demonstrating the barbaric nature of the LTTE even during the early days of the separatist war. The carnage shocked the entire nation and marked fist instance where innocent defenceless bus passengers became targets of Tiger brutality. 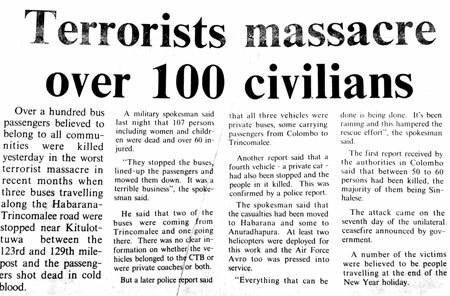 This was also believed to the first calculated mass civilian attack carried out by the Tigers, for most of the passengers were journeying after the Sinhala New year festivities, where crowds in buses were more than at normal times. 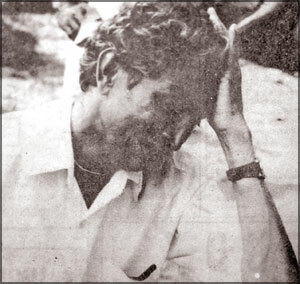 The attack was widely believed to have been carried out by well known LTTE hitman Pullendran who led many a massacre on unprotected villages bordering the North and East. According to a military spokesman a total of 107 persons including women and children were wiped out in one of the worst massacres carried out by the LTTE in it’s blood splattered history. Sixty others were injured most of them in a critical state. The passengers were travelling in three buses when the terrorist laid their ambush at a point on the lonely stretch between the 123rd and 129th mile post of the Trincomalee-Habarana road. “They stopped the buses lined up the passengers and mowed them down. It was terrible bushiness,” the spokesman said. He said two of the buses were coming from Trincomalee and one going in the other direction. There was no clear information if the buses belonged to the CTB or private coaches or both. Another report said that a fourth vehicle - a private car had also been stopped and the people in it killed. This was later confirmed by a police report. It was later revealed that all three vehicles were private buses some carrying passengers from Colombo to Trincomalee .A number of victims were people travelling at the end of the New Year holiday. First reports received on the attack claimed that between 50 to sixty persons were killed, the majority of them Sinhalese. The casualties were moved to Habarana and some to Anuradhapura. At least two Helicopters were deployed for the task and a AirForce Avro too pressed into service. Initially heavy rains hampered the removal of dead bodies and the transfer of casualties. The Habarana-Trincomalee road is a desolate stretch wending it’s way through thick forests with an eerie backdrop. It is the main supply route to the East but journeying though the starkly lonely passage had been a risky affair even at the best of times, according to military sources. It was certainly not a proposition for pleasure journeys. The buses are for most part over crowded and one is compelled to endure discomfiture because the journey had to be made. The bus to Trincomalee from Kandy that fateful Friday on the 17th was no exception. There were 113 passengers in it most of whom perished under hail of LTTE gun fire. Evidence of what happened minutes before the massacre were later recounted by the very few survivors some of whom feigned death to escape the LTTE butchery. It appeared that the bus was flagged down at the 124 th mile post, seventeen miles from Habarana, by persons donned in army uniform. According to the only two survivors to help the authorities at the Habarana Hospital Nimal Jayatissa and Shantha Ranasinghe the attackers dressed in military fatigues after stopping their bus demanded money and valuables from the passengers. It was then that it dawned on them that these were terrorists. Their escape from the hail of machine gun fire which turned the bus in which they were travelling into a charnel house was nothing short of a miracle. After the first burst of automatic rifle fire, the killers trod over the dead and the dying shooting all who moved. They did not spare the old, feeble and even children. “When they started shooting I threw myself on the floor of the bus and in seconds bodies fell over me. I held a little girl close to me and she too escaped,” Jayatissa said when interviewed by the Daily News. According to him after the first round of firing the killers probed the bodies on the floor with their boots for any signs of life. “I kept my mouth open, dribbling spittle hoping the man would go away. He pulled me up by the head and I went limp. He went away. A few minutes later Jayatissa said he raised his head and heard a young girl telling him that she too was alive. “I daubed her face in blood and told her to pretend she was dead-I am sure she was killed the next time they returned,” he said recounting his ordeal. Jayatissa remained motionless till a few minutes later - it seemed like hours - he heard more shooting. This was when the army arrived and realising this, he rushed out of the bus. Sarath Ranasinghe’s story was much the same. Both men were in the forefront of the first aid measures the authorities began soon after the tragedy. Jayatissa himself was a Red Cross worker based at Bisa Bandara, in Medirigiriya. 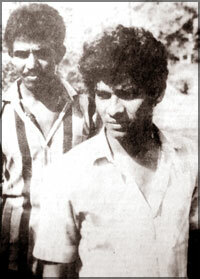 Ranasinghe was a timber contractor from Kantalai. Their’s was a tale of unspeakable horror tinged with poignant recollection of the ordeal they were forced to undergo and to be fortunate to be alive to recount to the world one of the most barbaric and inhuman acts one could ever imagine of man’s inhumanity to man, perpetrated by the most ruthless terrorist organisation in the world. “Over a hundred bus passengers believed to belong to all communities were killed yesterday in the worst terrorist massacre in recent months when three buses travelling along the Habarana-Trincomalee road were stopped near Kitulotuwa between the 123rd and 129th milepost and the passengers shot dead in cold blood. A military spokesman said last night that 107 persons including women and children were dead and over 60 injured. “They stopped the buses, lined-up the passengers and mowed them down. It was a terrible business,” the spokesman said. Another report said that a fourth vehicle - a private car - had also been stopped and the people in it killed. This was confirmed by a police report. The spokesman said that the casualties had been moved to Habarana and some to Anuradhapura. At least two helicopters were deployed for this work and the Air Force Avro too was pressed into service. “Everything that can be done is being done. It’s been raining and this hampered the rescue effort,” the spokesman said. The first report received by the authorities in Colombo said that between 50 to 60 persons had been killed, the majority of them being Sinhalese. The attack came on the seventh day of the unilateral ceasefire announced by Government.